I don’t know if you have noticed, but I get up to a lot of mischief at my house. My kids sort of expect it now. We have this oven mitt that looks like a crab claw. As soon as I put it on my daughter screams like the little girls she is and starts running. She knows that crabby claw is going to get her. I thought my trusty crab claw oven mitt was really cool, but now I feel all bad about it after seeing this Shark Bite Mitt. I mean, having a baby shark swallow your hand is much better than having a crab claw for a hand. 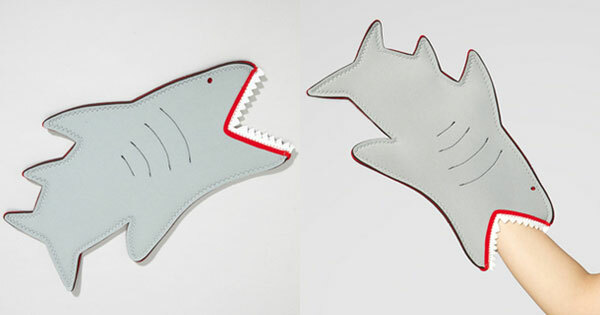 The shark is made out of polyester/neoprene/nylon blend material, which presumably will keep your fingers from being burnt off on the cookie pan. It measures in at 15.75″ x 9.25″ and it looks like the shark is eating your arm. It would have been cool if your hand went up the shark’s rump too so I could chase the kids with chompy the shark rather than crabby claws. I guess I am going to have to drop the $18 the thing costs overt at FredFlare.